I know what you're thinking. Christmas is over, right? 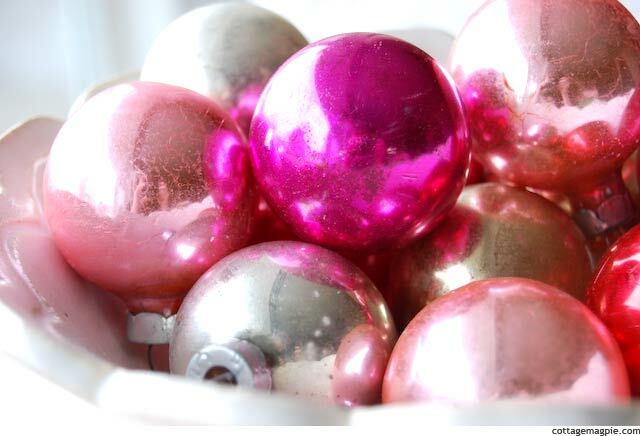 But these shabby Shiny Brite ornaments are just too pretty to keep in the attic all year! Plus, really, I'm lucky to have them. I have coveted the vintage Shiny Brite for years, but never been able to find any at my usual haunts. But then, a few months ago I was lucky enough to win a blog giveaway from Barbara "Pink Overalls" Pilcher, and whammo! I hit the Shiny Brite motherlode. You see, this is only a small selection of them. There were lots more. And admittedly I did pack most of them away with the Christmas stuff to be discovered next year (by which time my addled brain will have forgotten all about them). But I had had had to save out a few crackled pink ones to enjoy for a bit longer. Of course my favorite one is this pretty pale pink one. Just look at how the finish is all cracked. I love that. By the way, you really should pop over to Barbara's blog, DIY Home Staging Tips. She's funny and charming and great with a paintbrush. She just did a post on faux finishing a plastic flower pot to make it look more like cast concrete, and it's really cool. Check it out! Thank you, Barbara! The ornaments are just lovely!